This article describes how to view data in a JavaFX TableView. A UI is built in Scene Builder and a JavaFX Controller is implemented with a refresh function. The program begins by showing a Stage with a single Launch Button, built in code rather than Scene Builder. Pressing the Launch Button brings up a second Stage containing a TableView and a Button. On display of the second Stage, the TableView is filled with a list of domain objects. The Refresh Button can be pressed and the TableView is loaded with new data. The List of domain objects, called Participants, is retrieved in a JavaFX Task. When the Task completes, the contents of the TableView are removed and replaced with the retrieval. For this article, the data source is a hardcoded list. The data is slightly modified with each refresh by appending a counter. This is a video demonstration of the program. The article includes a Gradle project for building the code. See the Resources section at the end of the article. In the Controller panel, set the Controller Class to net.bekwam.bkcourse.simpletableapp.SimpleTableController. This is the name of a Kotlin class that has not been created yet. This article places the Java classes in a package “net.bekwam.bkcourse.simpletableapp”. Create a Java file SimpleTableApp.java. Add a main() method and override the start() method. Add the code to create a screen with a Launch Button. Set the onAction handler to a method reference (defined later). 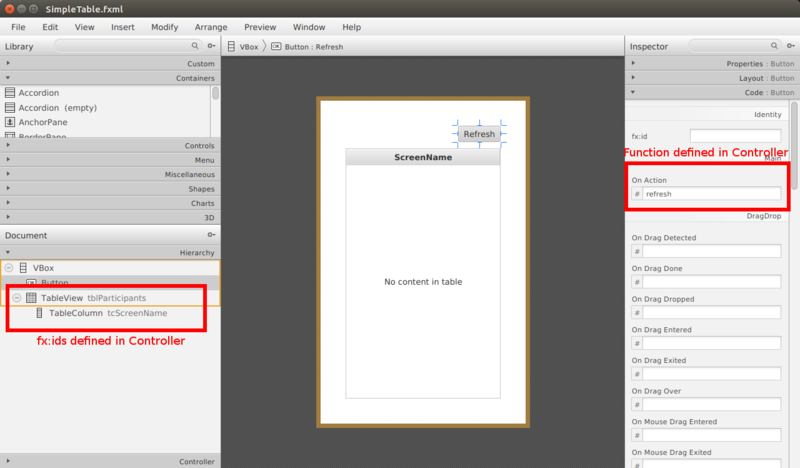 The showSimpleTable() method creates a second Stage holding the UI created from the .fxml file. FXMLLoader reads in the .fxml file and creates an object graph of the UI controls including the TableView and Refresh Button. Calling load() returns the root control which is used as the argument to the Scene. showSimpleTable() uses a Lambda to initialize the SimpleTable screen by calling the Controller's refresh() method. A handle to the Controller is retrieved from the FXMLLoader object. The TableView is backed by a domain object which is a POJO that represents data in the application. In this article, the domain object Participant is used which contains a single field “screenName”. This is the code for Participant. A JavaFX Controller links the objects created from the .fxml file with the data. Add the following file SimpleTableController.java. Start with the class definition and the pair of JavaFX controls that were tagged with fx:ids in Scene Builder. Both the TableView and the TableColumn are defined with generics including a reference to the domain object. The TableColumn has an additional type specifier for the field. screenName is a String. Next, add an initialize method. This is an instruction telling the TableColumn which field it will be displaying from the domain object Participant. Although the initialize() method is not mentioned in Scene Builder as was done for the refresh() method, it is still called by the framework because of the @FXML annotation. Although concurrency is generally regarded as an advanced topic, it is essential to use it even at beginning levels. The refresh() button could call fetchData() directly and replace the values in tblParticipants, but this type of shortcut could blow up a deployment when larger data sets or network latency becom apparent. Finally, add the fetchData() method that provides continuously-modified, hardcoded values to the program. fetchDAta() represents a call to the backend, say a RESTful web service call or a database call.